In March, the Saudi-led military coalition intervention in Yemen, dubbed ‘Operation Decisive Storm’, entered its fourth year. To mark the occasion, Houthi forces fired seven ballistic missiles into Saudi Arabia shortly before midnight on March 25, which the Saudi military claimed its defense systems intercepted. Riyadh responded by accusing Iran of having supplied the Houthis with the missiles and warned that Saudi Arabia had a right to “strike back” (see ‘Military Developments’). The United Nations Security Council adopted a wide-ranging new Presidential Statement regarding Yemen calling for, among other things, the full and sustained opening of all of Yemen’s ports to humanitarian and commercial imports, stressing the need for increased humanitarian access to Sana’a International Airport, and reaffirming that the denial of humanitarian access may constitute a violation of international humanitarian law (see ‘A New Security Council Presidential Statement’). Martin Griffiths officially took over the post of Special Envoy of the Secretary-General for Yemen. Griffiths began his tenure with a trip to Riyadh where he met Yemeni President Abdo Rabbu Mansour Hadi and other high ranking government officials; the new Special Envoy ended the month with a week-long visit to Sana’a, where he met with Houthi leader Abdul-Malik al-Houthi via conference call (see ‘The New Special Envoy’s First Month’). Last month senior Houthi negotiator and spokesperson Mohammed Abdel Salam also confirmed to the Sana’a Center that the Houthis were engaged in conversations with Saudi representatives in Oman, facilitated by the United Kingdom and involving the Special Envoy (see ‘Saudi-Houthi Talks in Muscat’). The Crown Prince of Saudi Arabia Mohammed bin Salman launched a tour of coalition allies that took him to Egypt, the United Kingdom and the United States, with opposition lawmakers in both of the latter raising concerns regarding their countries’ complicity in war crimes given their support for the coalition intervention in Yemen (see ‘Saudi Crown Prince visits coalition allies’). Meanwhile the UN, Sweden and Switzerland co-hosted a High-Level Pledging Event in Geneva at the beginning of April, at which US$2.01 billion were pledged by 40 states and organizations, equal to almost 68 percent of the UN’s US$2.96 billion Yemen Humanitarian Response Plan funding requirements. Saudi Arabia and the UAE together contributed almost US$1 billion (see ‘High-level Pledging Event Draws $2 Billion in Commitments’). In Yemen, the fragmentation of the General People’s Congress party – previously headed by the late former President Ali Abdullah Saleh – continued amongst the various factions based around Yemen and in regional capitals (see ‘Political Developments’). United Arab Emirates-backed Security Belt Forces launched a campaign to clear al-Qaeda in the Arabian Peninsula militants from the Mahfad district of Abyan governorate as part of ‘Operation Sweeping Torrent’, which has seen similar campaigns undertaken in the governorates of Hadramawt and Shabwa (see ‘Continued Expansion of Anti-AQAP Operations in South Yemen’). President Hadi ordered the liberalization of fuel imports in government controlled areas in an attempt to address widespread fuel shortages (see ‘Economic Developments in Yemeni Government Controlled Areas’). Meanwhile in Houthi-controlled areas widespread cooking gas shortages continued and the authorities introduced an electronic Yemeni rial to try and address the cash liquidity crisis (see ‘Economic Developments in Houthi-controlled Areas‘). Meanwhile, during the 37th regular session of the UN Human Rights Council (HRC) in Geneva, UN Deputy High Commissioner for Human Rights Kate Gilmore reported that Saudi-led military coalition air strikes were responsible for 61 percent of recorded civilian casualties in the Yemen conflict since 2015 (see ‘The UN Human Rights Council’). The United Nations Security Council (UNSC) adopted a new Presidential Statement (S/PRST/2018/5) regarding Yemen on March 15 following more than a month of discussions and negotiations. A UNSC Presidential Statement is a document adopted by council consensus as UNSC policy and publicly presented by the council president, in this case Karel Jan Gustaaf van Oosterom of the Netherlands, who was council president for March. The United Kingdom, Kuwait, the Netherlands and Sweden were the primary parties to the negotiations, which also involved direct consultations with non-UNSC member state Saudi Arabia. Discussions began towards the end of January, with the Netherlands and Sweden pushing for a UNSC resolution regarding Yemen’s humanitarian crisis. Simultaneously, Kuwait was calling for UNSC recognition of the Yemen Comprehensive Humanitarian Operations (YCHO) plan, which the Saudi-led military coalition intervening in the Yemen conflict announced in January. These led the UK, as penholder on Yemen, to begin pursuing a Presidential Statement, as it had already signaled it would do in late 2017. On February 13, the UK then submitted a draft text to council members, following which intensive negotiations on the language began (details available here). The fact that the UK put forward a Presidential Statement, rather than a resolution, was questioned by both the Netherlands and Sweden. A Presidential Statement is considered less weighty than a UNSC resolution and lacks the mandatory enforcement power of a Chapter 7 resolution. Thus, while important as a public statement asserting Security Council policy, the impact of a Presidential Statement is determined by further council actions, or lack thereof, to follow up on the text. The UNSC called on all parties to the conflict to abide by their obligations under international humanitarian law, though only Houthi forces were censured by name regarding attacks against civilians. Five non-permanent member states – Bolivia, the Netherlands, Peru, Poland and Sweden – as well as Russia opposed the UK’s inclusion in the draft text of a paragraph regarding Houthi ballistic missile attacks against Saudi Arabia; Kuwait, the United Kingdom and the United States insisted, however, and in the end the Presidential Statement contained a sentence stating that the UNSC “condemns in the strongest possible terms” these Houthi attacks. Kuwait also successfully lobbied to have references to Saudi-led military coalition airstrikes removed and weaken the language regarding accountability for violations in Yemen. Notably, the UNSC also heard last month from Kate Gilmore, the UN Deputy High Commissioner for Human Rights, who reported on March 22 that coalition airstrikes have been responsible for 61 percent of all verified civilian casualties in Yemen since 2015 (see ‘Human Rights and War Crimes Developments’ below). The Presidential Statement called on UN member states to “immediately disburse outstanding pledges and provide additional donor support” in the lead up to the April 3 Geneva Pledging Conference for Yemen, co-hosted by the UN and the governments of Sweden and Switzerland (see below ‘Humanitarian Developments’). The pledging conference was intended to raise funds for the UN’s US$2.96 billion 2018 Yemen Humanitarian Response Plan. The Presidential Statement said it “welcomes” the almost US$1 billion pledge to the UN response plan Saudi Arabia and the United Arab Emirates announced, the US$500 million the coalition partners said they would raise from other regional donors; the UNSC also notes “with appreciation” the coalition’s YCHO announcement. The UNSC then noted that it takes “extremely seriously” attempted Houthi attacks against shipping in the Bab al-Mandeb strait, and condemned the deployment of sea mines by the Houthis and other non-state actors. 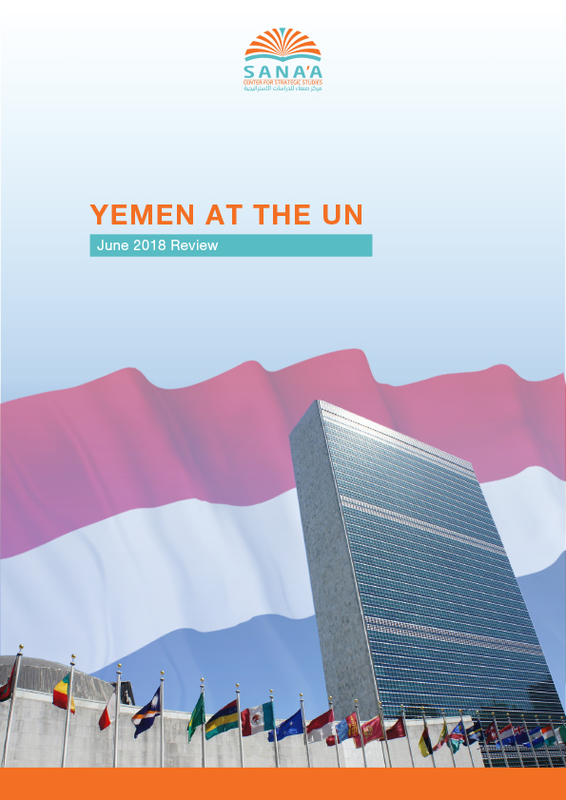 Also at the UNSC last month, on March 28 the council issued a press statement condemning “in the strongest possible terms” multiple Houthi missile launches into Saudi Arabia days earlier, on the third anniversary of the beginning of the Saudi-led military coalition intervention in Yemen (see below ‘Military Developments’). The following day Griffiths was in the Saudi capital, Riyadh, where he met with Yemeni President Abdo Rabbu Mansour Hadi and other high ranking government officials, including Hadi’s former Vice President and former Prime Minister Khaled Bahah. On March 24, Griffiths began a week-long visit to Sana’a, which included a meeting with Houthi leader Abdulmalek al-Houthi via conference call. Notably, Houthi leaders had banned the previous Special Envoy from entering Houthi-controlled areas and had refused to meet with Ould Cheikh Ahmed for most of his last year in office. The UN also appointed a new humanitarian coordinator for Yemen in March; Lise Grande, formerly the humanitarian coordinator for Iraq. She took over the post from Jamie McGoldrick, who in February was appointed as the UN’s Deputy Special Coordinator for Middle East Peace Process. The Crown Prince of Saudi Arabia Mohammed bin Salman launched an international tour of coalition allies in March, beginning with a visit to Egypt to meet President Abdel Fattah al-Sisi on March 4. On March 7, the same day Salman’s three-day UK visit began, Labour Party leader Jeremy Corbyn asserted in a House of Commons debate that British military advisers were “directing the war” the Saudi-led military coalition was waging in Yemen. Corbyn said that through this support and British arms sales to Riyadh — which totalled US$1.5 billion in 2017 — the UK government was “colluding in what the United Nations says is evidence of war crimes.” The following day protests against Britain’s role in the Yemen war and Prime Minister Theresa May’s meeting with the Crown Prince took place at Downing Street. On March 9, the UK government approved the sale of 48 Typhoon fighter jets to Saudi Arabia; although details of the deal were not released, a previous agreement with Qatar to sell half as many Typhoons aircraft was worth close to US$7 billion. The same day the Saudi and UK governments issued a joint statement affirming many aspects of the long-term strategic partnership between the two governments; in regards to Yemen, this included the two confirming the need for a political solution to the conflict and a commitment to continuing to work together to address the humanitarian crisis. The UK also “welcomed” Riyadh’s “continuing commitment to ensuring that the Coalition’s military campaign is conducted in accordance with international humanitarian law,” (see below ‘Human Rights and War Crimes Developments’). On March 20, Salman met with US President Donald Trump in Washington, DC, where he began a three-week tour of the US. On the same day, the US Senate voted 55-44 to reject a motion that would have forced the US to withdraw support for the Saudi-led military coalition’s operations in Yemen. The resolution, introduced at the end of February, had been championed by a bipartisan group of senators including independent Bernie Sanders, Republican Mike Lee, and Democrat Chris Murphy. Various Pentagon officials had publicly opposed the motion. Following Salman’s White House visit, the US administration announced new arms sales to Saudi Arabia valued at more than US$1 billion. Senior Houthi negotiator and spokesperson Mohammed Abdel Salam confirmed to the Sana’a Center during a discussion in Muscat in March that he was engaged in conversations with Saudi representatives in Oman. The conversations were being facilitated by UK officials and involved the new UN Special Envoy. Abdel Salam also confirmed that he had recently traveled to Germany and Turkey to discuss these countries’ role in facilitating peace negotiations. This new regional and international Houthi communications outreach can be seen as an attempt to end the isolation they have been experiencing since the collapse of the alliance between them and late former President Ali Abdullah Saleh. Prior to the Houthis killing Saleh in December 2017, the former president and his associates had managed most of the alliance’s international relations. March 4: Germany’s Christian Democratic Union and the Social Democrats voted in favor of a coalition agreement between the parties to form a new government; a clause in this agreement bans arms sales to countries participating in the Yemen conflict, such as member states of the Saudi-led military coalition. March 20: A European Union diplomatic delegation arrived in Sana’a, led by Antonia Calvo-Puerta, the head of the EU mission to Yemen, and including ambassadors from the Netherlands, France, and an envoy from the Swedish foreign ministry. Calvo said that among the issues they would discuss with local authorities are the humanitarian situation and conflict resolution. March 23: Using a loophole in the coalition agreement between Germany’s Christian Democratic Union and the Social Democrats – which includes a clause banning arms sales to countries participating in the Yemen conflict – Germany’s Federal Security Council approved the sale of eight navy patrol boats to Saudi Arabia. In March, it was apparent that Yemen’s General People’s Congress (GPC) party was continuing to fragment, a process that began following the killing of the GPC’s founder and leader, the late former President Ali Abdullah Saleh, in December 2017. Inside Yemen widening divisions were playing out between different party factions. Internal party developments are also being closely monitored by senior GPC officials spread across various regional capitals that include Riyadh, Abu Dhabi, and Cairo. On March 1, the GPC faction in Sana’a (headed by Sadeq Amin Abu Ras) rejected the decision by the Taiz-based GPC faction (headed by Arif Jamal, who is also the Deputy Governor of Taiz) to recognize President Abdo Rabbu Mansour Hadi as head of the GPC party. (Although a number of GPC Riyadh-based members remain loyal to Hadi, it is important to note that he was removed as the GPC’s secretary-general in late 2014). In mid-March, the Sana’a-based GPC faction dismissed Prime Minister Ahmed Obaid bin Dagher’s public calls for party unity. Based on Sana’a Center conversations held with several GPC officials in Cairo, there appears to be a direct acknowledgement among party ranks of the difficult adjustment period that the GPC finds itself in and an apparent reluctance to hold internal party leadership elections at the present time. One Cairo-based GPC official advocated for a joint leadership council in a bid to prevent the party’s increased fragmentation and to ensure the party remains an active player both inside and outside Yemen. March 16: Local media reported that the Southern Transitional Council (STC) had appointed Ahmed Hamed Lamlas as STC Secretary-General. Lamlas will oversee the STC’s organizational affairs with Aiderous al-Zubaidi continuing as the eminent STC leader. March 23: The Lebanese daily Arabic newspaper, Al-Akhbar, published an in-depth interview with Houthi leader Abdulmalik al-Houthi. The interview was reportedly the first that al-Houthi had done with a non-Yemeni newspaper since the Saudi-led military intervention on March 26, 2015. In the interview, al-Houthi touched on a range of topics that included: the ongoing resistance against the Saudi-led coalition; anti-Houthi military operations on Yemen’s Red Sea coastline; the Houthis’ ballistic missile program; the Israeli-Palestinian conflict and the Houthis’ relationship with Iran and Hezbollah. During the interview al-Houthi said that he was willing to send fighters to Lebanon to fight with Hezbollah against Israel. March 25: In a wide-ranging speech on the anniversary of the beginning of the Saudi-led military coalition intervention in Yemen, Houthi leader Abdulmalek al-Houthi warned against the “activity” of the Baha’i movement that he described as a “new satanic move” that was infiltrating Yemeni society and sought to challenge Islam. Human rights groups have repeatedly reported that the Houthis have subjected the Baha’i, a small religious minority in Yemen, to arbitrary arrests and imprisonment, mistreatment while detained, and carried out legal persecutions through which members of the Baha’i faith have been sentenced to death. To mark the third anniversary of the beginning of the Saudi-led military coalition intervention in Yemen, Houthi forces reportedly fired seven ballistic missiles at Saudi Arabia shortly before midnight on March 25. Saudi forces claim to have intercepted three ballistic missiles above Riyadh, another two over Jazan, and thwarted another two separate missile attacks aimed at Najran and Khamis Mushait, located in the south of the country near the shared Saudi-Yemeni border. One of the missiles reportedly intercepted over Riyadh resulted in the death of an Egyptian national and the wounding of others after debris fell on a home in the Saudi capital. Saudi Arabia responded to the attacks by accusing Iran of having supplied the Houthis with the missiles that were fired at the Kingdom. Saudi-led military coalition spokesperson Col. Turki al-Maliki declared that the attacks “could not have happened without support from Iran, which has supplied the Houthis with ballistic missiles,” and warned that Saudi Arabia had a right to “strike back.” Iranian officials denied such claims, while the UN Security Council and the United States condemned the Houthis missile attacks. The most recent Houthi ballistic missile attacks against Saudi Arabia bore certain similarities with an earlier ballistic missile attack on November 4, with the purported effectiveness of the Saudi Patriot missile air defense system once again being questioned. The Saudi-led military coalition spokesperson, Col. Turki al-Maliki, claimed that all seven ballistic missiles were successfully intercepted. Such a claim was challenged by video footage that emerged related to the missile attacks in Riyadh, including one video that appears to show a Patriot missile changing course shortly after being launched. The missile attack – coming three years to the day that the Saudi-led military coalition intervention in Yemen began – also held much symbolism, showing that the Houthis continue to be able to threaten Saudi national security despite the coalition’s ongoing campaign to force them into submission. On March 7, Security Belt Forces in Abyan launched “Operation Sweeping Torrent” that aimed to clear Mahfad district, northwestern Abyan, of al-Qaeda in the Arabian Peninsula (AQAP) militants. The Commander of the Abyan Security Belt Forces, Abdul Latif al-Sayyed, headed the operation. According to local media reports, Abyan Security Belt Forces arrested nine local AQAP commanders following the launch of the operation, including a man identified as Saleh Ahmed Lakra’a, the alleged AQAP emir in Mahfad; in addition to killing a man identified as the deputy emir, Nasser Mohsen Basabreen. “Operation Sweeping Torrent” is the latest of a series of recent UAE-backed counterterrorism operations targeting AQAP enclaves in Hadramawt, Shabwa, and Abyan governorates. On March 11, the Emirates News Agency said that “Operation Sweeping Torrent” had reached a successful conclusion with Security Belt Forces having cleared Mahfad district of AQAP militants with the support of the Saudi-led coalition. Whether AQAP militants in Mahfad withdrew from the district to avoid engaging with a superior force, however, is unclear. Saudi Arabia deployed ground forces in Haradh city, Hajjah governorate, on March 6, as part of an ongoing offensive that aims to clear Haradh city of Houthi fighters. The Saudi military joined a contingent of Sudanese and Yemeni government forces already operating on the ground in Haradh district. Yemeni government troops previously gained control of Midi port in January 2016 but have since failed to make any significant inroads either in Midi district or the neighboring Haradh district. The expansion of anti-Houthi operations in Haradh is representative of attempts to increasingly pressure the Houthis on multiple fronts, including in the Houthi stronghold of Sa’ada governorate. Anti-Houthi operations in Sa’ada, including those targeting key roads linking Sa’ada and the neighbouring al-Jawf governorate, continued throughout March. March 17: President Abdo Rabbu Mansour Hadi appointed Ali Saleh al-Ahmar – the half brother of the late former President Ali Abdullah Saleh – as Commander of the Reserve Forces, which are units that were part of the former Republican Guard, led by Saleh’s son Ahmed. March 18: The Government of Yemen’s acting Minister of Defense Mohammed al-Makdashi, speaking with the Sana’a Center in Marib, confirmed that an escalated anti-Houthi offensive in al-Bayda governorate has coalition support to proceed. March 19: A contingent of Security Belt Forces redeployed from Aden to Camp al-Jerba’ in al-Dhalea governorate, marking what would appear to be one of the first deployments of Security Belt Forces in al-Dhalea; presently Security Belt Forces are also currently deployed in Aden, Lahj, and Abyan governorates. March 20: The Governor of Hadramawt Farag al-Bahsani, in speaking with the Sana’a Center in Mukalla, confirmed that the recent Hadrami Elite Forces operation to clear Wadi Misini of AQAP militants took place with the UAE providing ground and air support, and American support in the form of intelligence and satellite imagery. March 21: The Houthis released a video that military experts said “showed a R-27T, or a Soviet-era missile” fired from a ground launcher hitting a Saudi fighter jet. The experts noted that this type of missile is normally fired from an aircraft and has an estimated 70 km range when fired at altitude. Saudi Arabia claimed that the aircraft returned safely back to base despite the attack, though military experts doubted this claim. March 28: Jane’s 360 published a report which, from the use of satellite imagery and ship-tracking data, asserted that the UAE appears to have stopped constructing a 3.2km runway on Yemen’s Mayyun (Perim/Barim) Island, located in the strategic Bab al-Mandab Strait, less than a year after construction had begun. March 30: Yemeni government forces advanced in the al-Qabbaytah district of Lahj governorate with the support of Saudi-led coalition fighter jets. On the same day, Yemeni government forces also clashed with Houthi forces in the Sirwah district of Marib governorate. April 3: Houthi forces fired on a Saudi oil tanker transiting the Red Sea, west of Hudaydah port. The tanker, which sustained minor damage, was reportedly carrying 2 million barrels of crude oil. The attack raised fear of an escalation against commercial shipping in the Red Sea. On March 1, media reports emerged that the Government of Yemen was planning to relocate the Central Bank of Yemen (CBY) headquarters from the southern Yemeni city of Aden to Amman, Jordan. CBY governor Mohammad Zammam, who took over the post less than a month earlier, subsequently denied such and said the rumors were being spread in social media. Days later, on May 3, the CBY governor was again forced to speak publicly to dispel multiple media reports that the US$2 billion Saudi deposit at the Aden CBY had been delayed. Sana’a Center sources reported at the beginning of April that the Saudi deposit was being held at the US Federal Reserve. On March 5, President Hadi ordered the liberalization of fuel imports in government controlled areas in an attempt to address widespread fuel shortages. Prior to this decision a private contractor, Ahmed al-Essi, and the National Petroleum Company had held a monopoly on fuel imports and distribution, respectively. Sana’a Center economists expect Hadi’s move will result in downward pressure on the value of the Yemeni rial (YR), mirroring the impact after Houthi authorities in Sana’a took similar moves to deregulate fuel imports in 2015. Then, fuel importation cartels rapidly accumulated wealth, with their subsequent demand for US dollars in the market essentially becoming insensitive to fluctuations in the rial exchange rate. In the week following Hadi’s announcement, the governors of both Marib and Hadramawt declared that they would not allow the deregulation of fuel imports in their governorates. Also at the beginning of March, the United Arab Emirates, which generally controls access to the ports in Yemeni government-affiliated areas, blocked cargo ships carrying some YR 170 billion from entering the port of Aden. The banknotes, printed in Russia, were intended to allow the government to pay civil servant salaries. The CBY has previously complained that the UAE – whose officials have long accused the Hadi government of corruption – have prevented airplanes with cash deliveries from landing at the airport in Aden. In this case, the blockade of the ships lasted six days before they were permitted to dock. On March 12 and 13, CBY Governor Zammam was in Beirut, Lebanon, where he met the Governor of the Lebanese Central Bank, Riad Salameh, for consultations about issuing foreign currency government bonds. According to Sana’a Center sources, however, the CBY’s recent history and current status has heavily eroded trust in the market and there would likely be little to no appetite for a Government of Yemen debt issuance, regardless of the interest rate attached to the bond. While in Beirut, Governor Zammam also met with representatives from the International Finance Corporation, which is part of the World Bank Group. On March 25, the UN Office for the Coordination of Humanitarian Affairs (OCHA) issued a report on cooking gas and fuel shortages. It noted that in Houthi-controlled areas a cylinder of cooking gas had risen in retail price from YR 5,000 three weeks earlier to between YR 8,000 to YR 10,000, depending on the area. While official outlets are selling gas at YR 4,000, anecdotal reports from Sana’a and other areas indicated that customers had to wait in line for up to three days to purchase gas at the official price, while OCHA noted that many families and bakeries had resorted to burning wood. Sana’a Center sources reported that the cooking gas shortage began in February after Houthi authorities attempted to set a fixed price per cylinder of YR 3,000, leading to a surge in black market vending. Given renewed fighting on the main road between Sana’a and Marib – the latter of which is the primary source of cooking gas in Yemen – the Sana’a Center predicts further rapid increases in cooking gas prices in Houthi-controlled areas. Also in Houthi-controlled areas, in another attempt to address the cash liquidity crisis, the Sana’a-based CBY launched an electronic version of the rial to enable purchases via mobile phone. The expectation is that there will be a two-month pilot program before there are attempts to bring the system into wider use. A Sana’a Center analysis of the plan noted that the CBY had drawn up the regulation for the electronic rial in 2014, but while the previous plan had envisioned a commercial bank-led model, the current system has the Yemen Mobile company taking the lead. Sana’a Center analysis also noted that if the electronic rial system is effectively “prepaid,” it will have little short-term impact on the liquidity crisis. If, however, the authorities attempt to use it to pay civil servant salaries, as is expected after the pilot program, the results will likely be similar to those of the voucher program the authorities in Sana’a attempted in April 2017: the electronic rial will create pressure on the local currency through increased demand for imported commodities, and quickly a price disparity will become apparent in the market where vendors will charge one price in exchange for physical banknotes and another for electronic rials. Among the long-term consequences will likely be the destruction of public trust in electronic transactions. Cappealaere stated that: “The education sector in Yemen is on the verge of collapse. It is collapsing. I have seen that in every single school I visited and heard that from every single teacher I spoke to.” He also warned of the societal impact of Yemen’s faltering educational system, which has been further compounded by increased unemployment and poverty levels, with many children being pushed into early marriage or child labor and at least 2,400 others recruited by different armed groups since March 2015. To combat poverty and the effects of unpaid salaries, UNICEF started a second round of cash transfers on March 26, funded by the World Bank’s International Development Association. The first round, which was completed in October 2017, had offered some support to about 30 percent of Yemen’s population. In support of the Yemen Humanitarian Response Plan (YHRP) 2018, the UN, Sweden and Switzerland co-hosted a High-Level Pledging Event at the Palais des Nations in Geneva on April 3. Donations totaling US$2.01 billion were pledged by 40 states and organizations, equaling almost 68 percent of the US$2.96 billion YHRP funding requirements. This included US$930 million that had already been provided by Saudi Arabia and the UAE, the largest contributors, on March 27. At a similar pledging event in April 2017, US$1.1 billion had been pledged for the previous YHRP. By mid-December 2017, only 70.5 percent of the US$2.3 billion appeal had been provided by the international community. March 12: The Yemen Protection Cluster and its lead-organization, the UN Refugee Agency, reported that more than 100,000 Yemenis have been internally displaced since December 1, 2017; the escalation of violence across frontlines in Hudaydah and Taiz governorates in January 2018 is one of the major factors behind this figure. Some of the most affected areas are Al Khawkhah, Al Garrahi, and Hays districts in southern Hudaydah, as well as Al Mokha and Mawza districts in Taiz. As of March 25, an estimated 42 percent of the local population of Hays and Al Khawkah districts had fled. In Yemen, more than two million citizens have been displaced, of whom over 76 percent are women and girls. March 12: The UN Migration Agency facilitated the voluntary return of 41 Ethiopian migrants and one Croatian migrant from Al Hudaydah as well as 144 Somali refugees from Aden. March 17: The WHO and the Yemeni government reported that 1,368 suspected cases of diphtheria, including 76 associated deaths, had occurred in 179 districts across 20 governorates, most notably in Ibb and Al Hudaydah governorates. March 21: The Food Security Information Network, comprised of major international humanitarian organizations in the field of food security, released its Global Report on Food Crises 2018. It highlights that “Yemen will continue to be the largest food crisis by far. The situation is expected to deteriorate, particularly because of restricted access, economic collapse and outbreaks of disease.” According to the UN OCHA, commercial imports entering Yemen through the UNVIM “have reached their all-time low in February 2018.” Data for March indicated imports had recovered slightly, though for a fourth consecutive month there were no containerized cargo deliveries to Hudaydah and Saleef ports. Due to import restrictions food prices continue to be largely above pre-conflict levels, contributing to a situation in which more than half of all Yemeni households are buying food on credit. March 25: The WHO reported that Yemen has seen 1,085,000 suspected cholera cases, 2,267 associated deaths, and a case-fatality rate of 0.21 percent since April 27, 2017. Amran, al-Mahwit, al-Dhalea, Sana’a, and Dhamar governorates have seen the highest number of suspected cases in relation to their respective population size. Although the weekly number of cases has been declining since week 36 of the cholera crisis, the rainy season, expected to occur from March to June, is raising fears of a renewed outbreak. March 31: Four warehouses full of aid supplies at Hudaydah port caught fire. The fire led to the destruction of cooking fuel, an estimated 50 tonnes of foodstuff, and other humanitarian supplies belonging to the WFP. The WFP started to investigate the cause. On March 21, during the 37th regular session of the UN Human Rights Council (HRC) in Geneva, UN Deputy High Commissioner for Human Rights Kate Gilmore reported on the human rights situation in Yemen, opening up a general debate on technical assistance and capacity building. Gilmore stated that since the beginning of the Saudi-led coalition military intervention in Yemen, the UN Office of the High Commissioner for Human Rights had officially documented 6,100 civilian casualties, including 1,491 children, and 9,683 injuries. Gilmore noted that the official monthly tally of civilian casualties has increased during the past six months, reaching a peak in December 2017, when 714 civilian deaths were recorded. According to the UN Office of the High Commissioner for Human Rights, Saudi-led military coalition airstrikes accounted for the majority (61 percent) of all civilian casualties, while Houthi forces’ indiscriminate shelling of and sniper fire against residential areas was identified as the second leading cause. Many observers of the Yemen conflict suggest the UN’s official numbers dramatically underestimate the civilian death toll from the conflict. On March 1, armed gunmen raided the offices of the al-Shomou Foundation in Aden and set fire to its printing presses. According to the president of al-Shomou Foundation, Saif al-Haderi, the unidentified gunmen “arrived in vehicles and wore uniforms” commonly associated with Aden’s Security Belt Forces. Al-Shomou Foundation is thought to be close to the Yemeni government and specifically Vice President Ali Mohsen al-Ahmar. In a separate attack on March 23, unidentified gunmen targeted al-Shomou Foundation’s Aden offices for the second time in the space of a month. The gunmen abducted at least seven people from the offices and stole money and equipment. On the same day, the home of the al-Shomou Foundation director was also raided. March 5-9: Multiple US drone strikes over several days near the town of al-Hudhi in Hadramawt governorate killed eight civilians, including seven IDPs and one child. March 7: Saudi-led military coalition airstrikes struck two family homes located in the suburbs of Sa’ada city, killing a girl and a woman, and wounding several other children. March 8: Coalition airstrikes hit a home northwest of Sana’a city, killing six members of the same family, including three children, and wounding seven others. March 22: A Saudi-led military coalition airstrike killed ten civilians, including an unidentified number of women and children, in the Ouled Amer village of Sa’ada governorate. April 2: A Saudi-led military coalition airstrike on a house in al-Hali district of Hudaydah city killed 12 people from the same family, including seven children. This report was prepared by Waleed Alhariri, Spencer Osberg, Farea al-Muslimi, Anthony Biswell, Ali Abdullah, Victoria K. Sauer, Taima Al-Iriani and Nickolas Ask.